AMP’s chief economist, Dr Shane Oliver predicts that the home loan interest rates could drop to as low as 2% as a result of three cuts to the cash rate. Although the Reserve Bank of Australia is expected to hold the official cash rate at 1.75 per cent on Tuesday, a prominent economist is predicting three more cuts – two later this year and one in 2017. The cuts mentioned above will be witnessed primarily in the second half of 2016 and the first quarter of 2017. 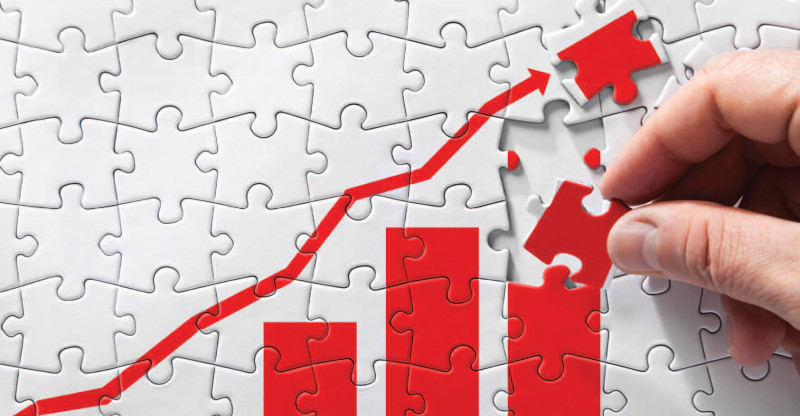 A 2% home loan interest rate is optimistic, according to the economist. The fall in interest rate will be driven by the cash rate being reduced to 1% if the cuts continue to occur in August, September and the Q1, 2017. Needless to say, this will lead to a massive increase in the demand for property loans and it might turn out to be a win-win situation for financial institutions as well as the property buyers and sellers. Last week it was reported that mortgage rates below four per cent on variable or fixed terms for up to five years were possible for borrowers, according to The Australian. 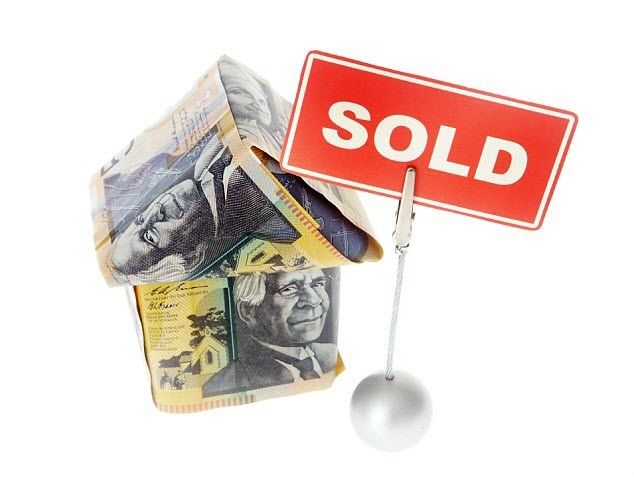 Before the cash rate hit 1.75 per cent in May, the lowest five-year fixed home loan rate advertised was 4.34 per cent. With proper market research, it is possible to get home loan interest rates that are close to 3%. Most people do not research enough and they end up paying more interest. The easiest way to work your way around home loans is to use the services of a home loan specialist who knows the market and has experience in closing deals. The future of the residential property market in Australia looks lucrative, but you should not rely completely on the predicted metrics. Plan your investments and wait for the right time to make your move. This will ensure that you get the lowest home loan interest rate in the market and get your home loan approved fast. Your credit score is the single most important factor that affects all types of financing and credit requirements that you might need from financial institutions. It is basically a representation of your track record of managing your finances and repaying debts. After all, lending money has its fair share of risks and lenders would like to have some form of assurance that their money is not going into the wrong hands. Without a good credit score, you will have a face a lot of hurdles and problems while getting your home loan approved. If you want to avoid such problems, then make sure that you work on building and improving your credit score. If you don’t think you will be able to pay off the debt in a reasonable amount of time, then don’t take it on in the first place. Debts are good when planned and repaid properly. The longer your repayment duration, the more interest you will have to pay. This will definitely have an impact on your finances. The best way to tackle this situation is to pay more than the EMI and complete the debt as soon as possible. Credit cards have a higher interest rate than other types of loans so make sure to pay off the balance every month and don’t spend beyond your means. Also, avoid debts unless absolutely necessary. This will help you to avoid hassles. Not paying your bills on time is one of the most common reasons credits scores are hitting the floor for so many people. Probably the most difficult thing is to keep a control on your expenses when you have credit cards at your disposal. When it comes to repayment, people usually go beyond the deadline and / or skip the monthly payment. This affects the credit score badly. If you are not able to repay the required amount, then pay AT LEAST the minimum BEFORE every due date. Do you know your credit score? Is it accurate? If you don’t understand your credit score, then it’s about time that you checked your report and took a better look at the finer details. The situation might be grimmer than you anticipate. Some of the important factors which affect your score are as follows. 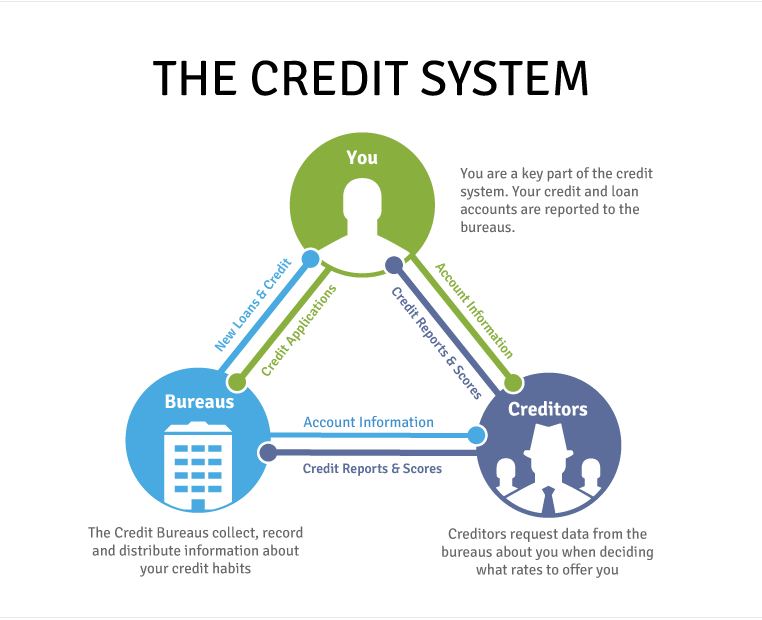 A credit reporting system is made up of three main players: consumers, credit bureaus and financial companies. You need to understand the system and find out the exact parameters and metrics that affect the credit score. Understanding the system will help you to use the system to your advantage by planning your finances and debts in such a way that it helps you in enhancing your score and providing you with a lucrative appeal. 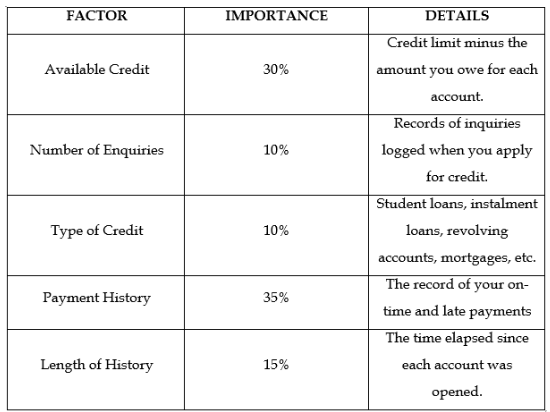 The following diagram should help you to understand the relation between the important elements of the credit system. Statistics show over 80 percent of consumer’s credit reports have errors. This literally kills most credit scores. Most of the times, the errors are left in the report because they are not detected and modified accordingly. Don’t expect the authorities for you as they have thousands of reports to manage. You need to proactively check the reports and communicate errors and irregularities with supporting evidence. The sooner you clear the report of errors, the better your chances will be of getting an accurate credit score. 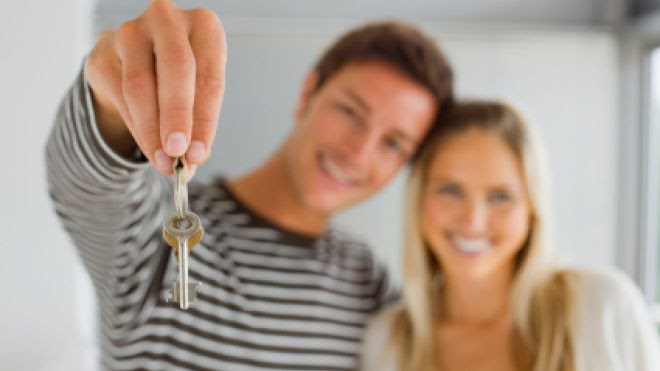 Getting a home loan approved can seem like a daunting task and most of the time it does get daunting, especially if you do not know how to go about getting it approved. From extensive paperwork to getting the costs worked out, there are a lot of steps involved in a home loan. It is not advisable to undertake this task on your own. But if you have decided to go ahead, the make sure you follow these home loan tips. Analyze your income, savings and financial position to find out how much mortgage you can afford on your home. Don’t keep false estimations. Stick to realistic limits and add a 5% buffer on that as a precaution. You would not want to run into financial problems after getting a home loan because you might lose your home and weaken your financial strength greatly. Create a carefully planned budget for at least 6 months prior to applying for a home loan. No lender will prefer approving a loan to someone who has an unstable profile. Lenders like to see that your living situation is stable. You need to have a stable job and show a stable rental history. In case you are compelled to change your residence, make sure that you stick to your line of work. Heading off into a completely new work profile might seem unpredictable to the lender and your home loan could get disapproved. It is quintessential to understand your credit score because a good score can get your home loan approved faster. A good score also instills faith in the lender with respect to your financial stability. Check your score before applying for the loan. If it is not good enough, then spend some time improving the credit file and then apply for the loan. This will save you from unnecessary hassles and rejection. You need to show the lender that you have sufficient income and savings to live comfortably despite having to pay monthly mortgage. If you’ve got credit cards, lower your limits and if you have more than one, reduce this down to one or none. An important fact to be aware of is that for every $100 of credit limit you have, this lowers your borrowing capacity by up to $500. The less debt you have, the higher will be the chances of your home loan getting approved. During this 6 month period, you want to ensure that your bank accounts portray the right picture to prospective lenders. Avoid late payments, keep your account from getting withdrawn, ensure that checks don’t bounce and maintain the minimum balance as stated by your bank. Also, make sure that all transactions are 100% legit with proper accountability. Professional home loan specialists can help you get relief from the stress that is usually associated with getting home loan approved. Not only do they offer you valuable advice to ensure that your home loan gets approved, but they also help you all along, be it in managing the documents or seeing the completion of a particular procedure. Get in touch with our experienced professional home loan specialists for getting your home loan approved and making your dream home a reality.